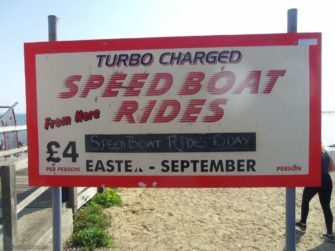 Speedboat rides don’t sell themselves, they’re turbocharged by the barker onshore, it’s usually just the one man, but joined by a second man today. He’s having to do a little bit of work getting people onto the jetty before the Charger arrives back so there’s a quick turnover. In previous years there would have been a couple of short excursion trip boats operating from here with the shore side staff shouting out and selling tickets for that next sailing so it’s a little bit of the past hanging on in modern Essex.